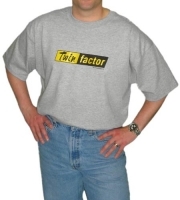 Twin Factor Mens T-Shirt Discounts Apply ! Twin Factor for dads just let's the world know that challenges are faced and conquered daily (if not hourly). There's just so many factors involved with having twins, we thought this shirt would be a humorous way to look at it.